Delusions, as Jaspers remarked, have always been the archetypal symptom of madness. It is surprising, therefore, that contemporary psychiatry has rather little to say about delusions or about the ways in which delusions change with time and culture. In this talk, I make some suggestions about why this is the case. Further, I discuss the changes to psychiatric thinking that are required to better understand delusions and, thereby, psychosis. Duncan Pederson and Alain Brunet together with Hanna Kienzler and Bhogendra Sharma were successful in receiving a Grand Challenges Canada grant to begin work in Nepal. The grant will enable them to pilot a reconsolidation blockade intervention with survivors of torture at the C-VICT centre in Kathmandu. The group will also carry out qualitative interviews with counsellors and survivors documenting narratives of distress. Dr. Brandon Kohrt, a psychiatrist anthropologist who has done extensive ethnographic and cultural psychiatric research in Nepal has joined the project to collaborate on work in Nepal. Amir Raz's student, Eli Sheiner has been doing preliminary research in Japan, interviewing academic researchers about the interaction between culture and hypnotic suggestion. Claire Champigny, also a student of Raz, is studying cross-cultural differences in hynotizability, with a view to developing a pilot study to be conducted with student populations in Singapore. Lauren Ban, former postdoctoral fellow now based at the University of Melbourne, is developing a project to investigate cross-cultural differences in "folk theories" through which ideas of disorder/pathology are filtered. This will be used for a questionnaire and interview study to be done with psychology students in Singapore. The meeting, Placebos in the Clinic? Fostering Ethical, Educational, Policy and Practical Consensus, will bring together prominent placebo researchers from diverse fields as well as physicians, policy makers and related experts to discuss the realities of using placebos, placebo effects and placebo-like treatments in clinical practice. This workshop presents the latest advances in a range of experimental methodologies from brain imaging with MEG to epigenetics with the goal to develop cross-disciplinary investigations of interactions between cultural and neurobiological processes. This course provides an overview of recent controversies surrounding cognitive neuroscience and the implications of the emerging fields of social and cultural neuroscience for psychiatry, industry, policy and other areas of social life. 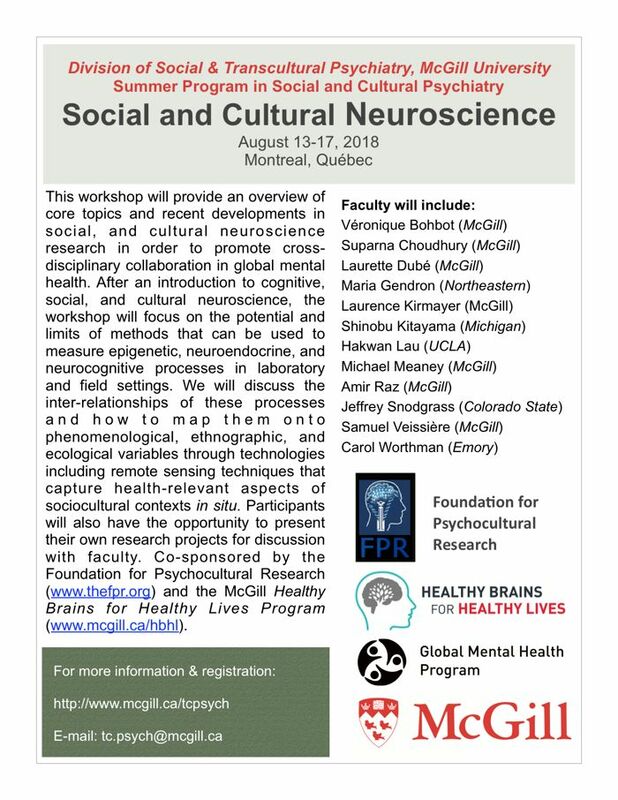 It will present key studies in social and cultural neuroscience from the last two decades and examine the potentials and limitations of predominant methodologies, particularly neuroimaging. The course will present the interdisciplinary project of critical neuroscience as a framework and set of tools with which to critically analyze interpretations of neuroscience data in the academic literature, their representation in popular domains and more broadly, the growth of neurocultures since the Decade of the Brain. The course will problematize and consider alternatives to neurobiological reductionism in psychiatry, neuroethics, cultural neuroscience and neuropolicy, attending to the models, metaphors and political contexts of mainstream brain research. It will also explore various avenues for engagement between neuroscience, social science and humanities. This is an interdisciplinary graduate level course and part of the Summer School in Transcultural Psychiatry. In-depth knowledge of neuroscience is not required but some understanding of neuroimaging research in cognitive neuroscience is useful. The course is relevant to neuroscientists interested in the social and political implications of their research, as well as psychiatrists, mental health workers and medical anthropologists interested in the meaning, limits and possibilities of emerging forms of "evidence" in biomedical cultures.